Ever since her older brother started piano lessons last summer, my 6 year old daughter has been dying to learn as well. She has 4 siblings who could teach her piano but none are willing to (I've even offered to pay them). To say she was happy to do KinderBach would be a huge understatement. She was nearly jumping up and down with excitement. And her "tagalong" little sister (age 4) was just as thrilled. 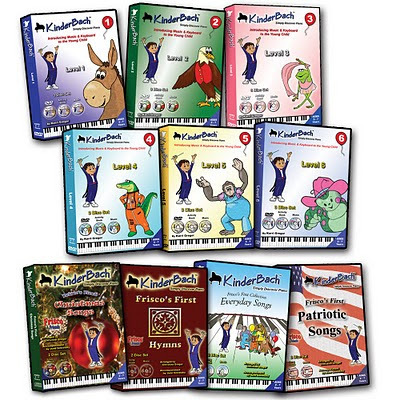 The KinderBach curriculum is a proven teaching method which gives children a solid music foundation, aligned with the MENC National Standards for Pre-K,that can translate to any instrument. Basics are basics and KinderBach covers them using language children understand. Youngsters will learn music vocabulary, note reading, rhythm, physical technique, ‘do, re mi’ singing, listening skills and music composition plus the joy in making music. Karri Gregor stars in each video. She is a bubbly teacher infusing enthusiasm, energy and lots of fun into each and every lesson. She clearly explains concepts, and repeats them so that everyone can follow along. I like how she speaks directly to the child as if they were in their own special music class with Ms. Gregor as their teacher. She is the perfect teacher for the targeted audience of 3-7 year olds. To use the program, a keyboard is recommended. If you have a laptop that you can move to where you have a piano, that would work just as well. But you'll want the piano or keyboard in the same vicinity as your computer while you are watching the lessons. Activity pages are also an integral part of the program. The activity page may be a coloring sheet or it may be an exercise to go along with the lesson. Some of the first exercises involved learning to distinguish between high and low sounds on the piano, listening for loud and soft sounds, and identifying the correct number name for each finger. The program starts with very basic music concepts that even the youngest children can understand and slowly & systematically progresses through more advanced topics. The entire program includes 60 lessons (10 lessons within each of 6 levels). 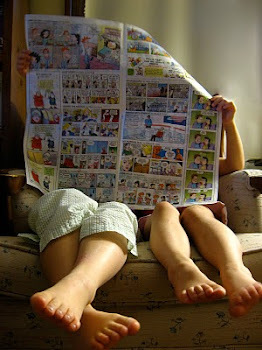 The video segments are short and sweet--perfect for young attention spans. You might find your kids begging for more than one lesson at a time. We often watched more than one and then on subsequent days, we sometimes reviewed a previous one and then moved ahead one or two lessons. For a complete overview of the program, read over the scope and sequence of the curriculum. You'll see in detail what activities and skills are covered for each level. We used the program on a desktop, a laptop and also tried it out on our internet channel through the Wii. Watching through the Wii provided the biggest viewing option. You'll want to either have all your activity sheets printed off before you start or be connected to a printer so you can print them off for the lessons. Each week has an introductory video that tells exactly what materials you will need for a lesson such a rhythm instrument (we just used two wooden spoons from the kitchen), crayons and sometimes scissors for the activity page. Both my 4 and 6 year old daughters absolutely LOVED the program. When I would tell them it was time to do KinderBach, they would both come running and they always wanted to do more than one lesson. The coloring and lesson sheets were also a huge hit with both of them. No reading was required to learn and understand the lessons so this is a marvelous preschool option. I think the program is an excellent introductory music course to not only provide a fabulous foundation in music but also help children transition into formal music lessons. KinderBach provides a very insightful article about the academic benefits of music instruction (piano in particular). Read all about how learning music can improve a child's skills in Reading, Writing, and Arithmetic. The only suggestion I would have for improvement would be a way for the online video to be viewed at full screen for greater visibility. Remember that the first two weeks of lessons are free. If you'd like additional access to decide whether to purchase a membership, you can pay $5.99 for a one day pass. When you decide to purchase, you have a couple options: Subscribe to the course online for $19.99/month or $95.88/year ($7.99 each month). If you'd prefer to purchase the program on DVD (recommended for those with slower internet connection), individual levels can be purchased for $40.45. To save money, you can buy various levels together (information and pricing on various bundles can be viewed here). The DVD package includes the lesson, an audio CD as well as a CD with all the activity pages. For the best value, purchase the Bonus 1-6 Bundle which includes all 6 levels and all 4 songbooks for $222.88. Level 7 is scheduled to be released August 2011. How would you like to win 3 free months of KinderBach? Enter the "Singin' in the Rain" contest by e-mailing or posting your child's music composition and you might be the lucky drawing winner. For complete details, visit here. Check out the fun supplemental sheets to help your child with their composition. Very useful materials whether you enter the contest or not. Classroom Kinderbach is also available for school classrooms. Complete pricing and information on Classroom Kinderbach can be found here. Teachers can order a week's worth of lessons to try it out. For additional reviews of this product, visit the TOS Homeschool Crew Blog or read testimonies from many satisfied KinderBach users. Disclaimer: We received a trial subscription to Kinderbach for the purpose of review. No other compensation was received. Looks like it would be fun!